Are your kids and grandkids moving in with you? Believe it or not, it's a good thing. The myth: Because of the economic downturn, grandparents across the country are moving in with their adult children. I hear this over lunch, I hear it on TV, I hear it on the radio. And while it may sound logical, it’s not accurate. The truth: Because of the economic downturn, adult children across the country are moving in with their parents — 62 percent of the more than 6 million multigenerational households in the United States were created by grown children moving in with their parents; in 50 percent of those cases, financial trouble was the main factor in the decision. But don’t we grandparents have even bigger money problems? Some of us do, of course, but many of us don’t. We grandparents still control more than three quarters of the nation’s wealth. We took less of a hit when the stock market tanked because our investments tended to be less risky, and we’re less likely to have an upside-down mortgage or, for that matter, any mortgage at all. No wonder our grown children are moving back. According to our recent national study, The Grandparent Economy, grandparents are spending about $32 billion on their grandchildren’s education, $11 billion on clothes for the kids, $6 billion on toys, and nearly $700 million on diapers. And while many observers assume that economy-driven multigenerational living is an emotionally traumatic hardship, that’s another myth. The truth? Many grandparents tell us not only that they love having their family back under their roof; they also love being needed again. They say it brings purpose to their days, and meaning to their lives. The physical demand of keeping up with the kids makes them feel younger; outdoor play burns off both calories and tension; and helping with homework provides excellent mental stimulation. There’s a lesson here. We humans are built for family life. In a crisis, or after a disaster, it’s always family that gets us through. Children must be fed, dressed, and taken to school, so we rally and we do it with a smile. In fact, studies have found that the more we act like everything is okay, the more we actually believe that everything is going to be okay. Family living forces us to have regular, face-to-face contact, which reduces isolation and wards off depression. The predictable routines of family life reduce stress; the act of nurturing, researchers have found, triggers innate biochemical stress-antidotes. 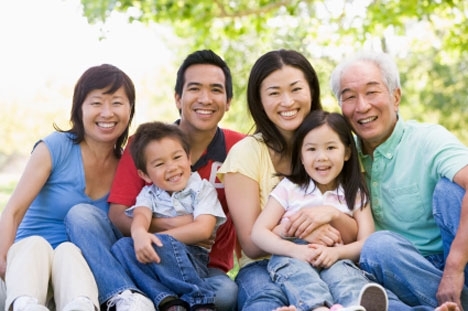 Multigenerational living can have clear benefits for kids as well. They get to experience a “chain of love,” learning that more than one adult can care for them, and seeing that if anything should happen to their parents, their grandparents will be there for them. Grandparents can help children get through illness and survive their parents’ divorce. They can help when working couples can’t get home for dinner or bedtime, and when single parents are overwhelmed. They can give kids the undivided attention that parents and siblings sometimes can’t because of all the demands on their time. Even if a family doesn’t have three generations under the same roof, the presence of grandparents in the lives of children can be critical. One of several similar studies of teen life found that adolescents who have daily contact with at least one grandparent are less likely to use recreational drugs. Why? Most likely because grandparents provide lots of conversation, encouragement, and problem-solving advice, and help kids stay focused on their future. 1. Make room. It’s not the amount of space that matters, it’s the respect for independence and privacy. Make sure all members of the family have a spot they can call their own where they won’t be disturbed. 2. Make nice. Before you criticize or correct a family member, review in your mind all the things you love and appreciate about the person. Even better, do it out loud. To them! Thinking good things isn’t enough. Everyone needs positive as well as negative feedback. If you can’t offer both, hold your complaints until you can. 3. Make rules mutual. To live together, you have to agree about what you’ll do when you disagree. So, make sure you have some rules about conflict resolution along with house rules about food, chores, and curfews. Some families hold regular meetings, others leave notes, but the bare minimum should be five minutes of direct, face-to-face contact to catch up each day. 4. Imagine you’re making a movie. When things get tough, pretend that your family members are characters in a film you’re writing. It will help you get some psychological distance and enough emotional breathing room to feel in control again. You may even get a laugh. 5. Treat your family like your friends. It sounds strange, at first, but think about it: You treat your friends with patience, you listen to what they have to say, you give them advice, and you give them the benefit of the doubt. Treat your family with as much consideration as you do your friends and multigenerational living will go much more smoothly.